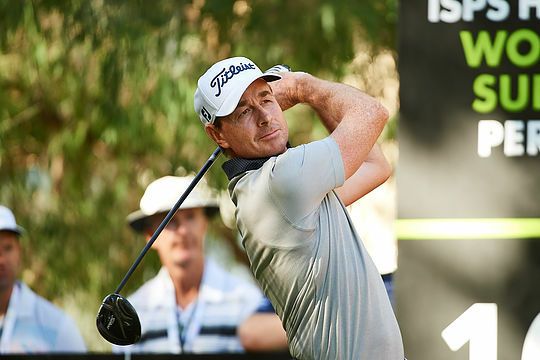 Reigning ISPS HANDA World Super 6 Perth champion Brett Rumford got his title defence off to the perfect start at Lake Karrinyup Country Club. The West Australian was off to a flyer with seven birdies on his front-9, he stumbled with bogeys on the 1st and 3rd holes (his 10th and 12th) before getting back on track with three more birdies coming home to finish 8-under 64 and hold a two shot lead. “I’m leading, I’m inside the top-24 and that’s my only focus this week is to finish inside that number whether I lead the qualifying again. That would be a nice bonus but it’s not my priority this week and I’m playing accordingly,” said Rumford who led for all three rounds in last year’s tournament before the match play on Sunday. Rumford played in the same group as Lee Westwood, who finished on 6-under 66 to hold second position early, the pair enjoyed a ding-dong battle throughout their round before Rumford pulled away to lead by two. The third player in the group, Andrew ‘Beef’ Johnston, set the tone with an eagle on the 10th, their first hole of the day. “I think Beef threw the first punch with a 2 at our first, the 10th hole, and I guess we just fed off each other from there,” added Rumford. Westwood said he was happy with his strong start to the tournament, albeit with some putts not dropping, and hopes to cement his place inside the top-24 as Sunday approaches. “6-under is a nice start to the week, I think it’s the kind of format where you don’t really want to be chasing. If you can get out to a fast start, I think everybody’s just trying to make the top-24 for the final day,” said Westwood. Playing in the afternoon, Novocastrian James Nitties made a late charge for the lead reaching 7-under par before finishing 6-under 66 for his share of second place alongside Westwood. He and the rest of the field playing in the afternoon had to contend with a wind that was proving difficult to read for many. “It definitely wasn’t the Fremantle Doctor, the toughest thing about it was trying to pick which way the wind was going,” said Nitties. Nitties came home with a wet sail with a bogey on his second last hole but made an impressive par save on the 9th, his last hole. Sitting one shot behind Westwood and Nitties is a group of nine players including; Jason Scrivener (AUS), Sebastien Gros (FRA), Prom Meesawat (THA), Daisuke Kataoka (KOR), Nicholas Fung (THA), Wade Ormsby (AUS), Kiradech Aphibarnrat (THA), Yi-keun Chang (KOR) and Gareth Paddison (NZL).